The "Wizard of Menlo Park" brought the world electric light, recorded music, and the movies, among other things, and turned innovation into a science by inventing the research laboratory. Born in 1847, Edison would witness tremendous change during his lifetime. He would also instigate many of those changes. At age 12, he began work as a train boy on a Michigan railroad. That newfangled conveyance brought with it the telegraph, and soon young Edison, whose hearing was deteriorating, found work as a telegraph operator. The self-taught boy set up a mobile chemistry lab and printing press, and tinkered with telegraphy instruments, his lifelong habit of experimentation firmly in place. Over his career, Edison would successfully patent a record 1,093 inventions in the United States -- more than double the number of his closest competitor, George Westinghouse. 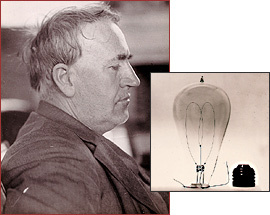 Edison invented or refined devices that made a profound impact on how people lived. The most famous of his inventions was the incandescent light bulb (1878), which would revolutionize indoor lighting and forever separate light from fire. He also developed the phonograph (1877), the central power station (1881), the motion-picture studio (1892) and system for making and showing motion pictures (1893), and alkaline storage batteries (1901). Edison improved upon the original designs of the stock ticker, the telegraph, and Alexander Graham Bell's telephone. He was one of the first to explore X-rays, and in 1875, he announced his observation of "etheric force" -- radio waves -- although his claim would be rejected by the scientific community. Aside from being an inventor, Edison was also a successful manufacturer and businessman, marketing his inventions to the public. In 1876, the year of the American centennial, he opened his first full-scale industrial research laboratory in Menlo Park, New Jersey. It combined electrical and chemical laboratories with a machine shop. By 1880, his hand-picked staff was developing commercial electrical lighting components, and Edison opened a factory to produce them. Within seven years, there were 121 Edison central power stations across the country, each obliged to buy Edison components. For financial security, he sold a share of the business to banker J. P. Morgan, renaming his company the Edison General Electric Company. In 1892, following another merger, Edison would get out of the electricity business, and his loyal assistant, Samuel Insull, would head to Chicago to make his own name in power delivery. The inventor's life was not always easy. A myriad of business liaisons, partnerships, and corporations occupied Edison, and his legal battles were continuous. He also erred at times -- for instance, when he bet on direct-current (DC) power systems instead of the alternating-current (AC) being touted by George Westinghouse. Yet Edison maintained a positive outlook. Of his failed attempts at the light bulb, he said, "They taught something that I didn't know. They taught me what direction to move in." In tribute to this unique individual, Americans dimmed their electric lights for one minute on October 21, 1931, a few days after his death.